I remember going into the Curtis Mathes Showrooms as a youth in the early 1960’s they were always so elegant and full of wonderful new console televisions and beautiful stereos. Later when I was a college student I won two design awards both in 1979 and 1981 from the Curtis Mathes Company. I was majoring in Industry Psychology and Design and it was always a wonderful treat when I could enter a design contest; especially one from a major manufacturer like Curtis Mathes. Below is a Authorized Distributor banner from 1961 that was given to me from a closed Curtis Mathes Showroom. After I graduated from College in 1982 and I worked for Zenith in their radio design department, and also did some freelancing work for Curtis Mathes in Console design from the years 1982 to 1984. It was always a joy to help lay out a new console television design and see it take form. There was always much more freedom in design at Curtis Mathes so by the mid 1980’s I worked for them exclusively. I worked for the Curtis Mathes Company exclusively from the years 1986 to 1991 as a console television and stereo designer. The photograph below is one of the televisions I helped design in 1984, and yes she still works great. This is a short history of the once famous Curtis Mathes Electronics Company. In 1957, Curtis Mathes & Associates purchased a major interest in the Olive-Myers-Spalti Manufacturing Co. The new firm, called Curtis Mathes Manufacturing Company, combined its decades of furniture building and electronics experience, first to enter the hi-fi business and, in 1959, the television industry. With these changes, Curtis Mathes started its tradition of combining top quality video and audio products housed in fine furniture. Just four years later, the Company entered the world of color television, beginning the era in which the Company became a household name. Below are two photos of site member "modernman" beautiful 1961 Curtis Mathes "Imperial Dane"... She looks and plays as good as the day she was made. I think Lucy is very happy with this television.... Great job "modernman".. what an awesome room, very nice retro design, just stunning. Very beautiful and stylish. Below is a photograph of one the wonderful consoles the company was making in 1960, and yes she still is working as well. The photo below is of Nancy Jones beautiful Curtis Mathes Stereo with a Deluxe AM/FM radio, turntable, reel to reel and at one time a television in the top center. The three photos below are of a beautiful 1968 Curtis Mathes three in one color console. You can see the craftsmanship in her wood-work and style. It was in 1972 that Curtis Mathes was the first manufacturer to offer a completely solid-state product line, with an unprecedented four-year warranty. In 1975 Curtis Mathes, Jr. purchased the company from the shareholders. In 1978 Curtis Jr. began demonstrating what would become another hallmark of the Company: heavy use of advertising to position and promote products. That year, an $18 million advertising investment yielded sales of more than $152 million. Millions of Americans came to know that Curtis Mathes was..."The most expensive television in America, and darn well worth it!" Below is a photograph of the Curtis Mathes plant in Athens Texas. The huge plant is now empty and has not been used in years, very tragic. In the year 1979 Curtis Mathes established ColorTyme, a home entertainment rental company, to meet the increasing demands for quality home entertainment equipment. In the years 1982 the Company began franchising its name across the country, the corporate headquarters were moved from Athens to Dallas and the Company’s manufacturing plant in Athens, Texas was sold. Then in 1988 the entire Company was sold and relocated back in Athens. During the period I worked for the company the Athens plant became the center of television and stereo production for the entire company. This was a awesome time in the history of our nation, back before our once proud and powerful electronics industries were sold out to the slave markets of Asia in a horrible unfair free trade agreement. Now because of the greed and stupidity of a few men not one television is made in North America. This is a wonderful Curtis Mathes Company photo taken by James Cooper it was around 1982 at a banquet in Athens. It is of a good number of the engineering group circa 1982. James believes this was shortly before the moved to Las Colinas. James remember Curtis Mathes Jr. was there that evening because he sat right next to him! He ate a double layer of steak! Unfortunately, he left before James took this picture. Also, alas, James is not in the picture because he was taking the picture! Below is an nice photo from 1983 of a Curtis Mathes Home Entertainment Center. The three photos below are of a beautiful late1960's three in one model color console from Curtis Mathes, made in Texas, and yes she still is working today like a new model. Photo below is one of Curtis Mathes Company first color televisions and yes she also is still working! This beautiful console is from Charlie Trahan, he has a awesome collection she is a 1966 Curtis Mathes TV/Stereo. This wonderful 1961/62 consolette that was saved from the trash truck. Saved by Audubon5425 A of the Antique Radio Forum. It is badged "Hi-Fidelity" and has seperate bass & treble controls along with a 6BQ5 driving that nice-sized speaker. Below is Karah with one of our huge Curtis Mathes 1960 radios. The sound from this old girl is wonderful. Below is a AD for a very nice console we sold at Curtis Mathes. She was one of the last all wood pieces that came out of Athens Texas, and was made a few years before I started working for the company. She was a little bit before my time at the company but we still had a model of her as a prototype. I have the model below that no longer has the television in the cabinet. But the turntable, radio and speakers are still with her and function. A friend in the wood working department put the shelves in her for me. She is still a very beautiful piece of furniture. I only wished I had a television reinstalled at the time in her. But at least I have the model. The photo below is with her drawers open. Still wish I had them put a CM televison in her. Back to the Curtis Mathes days of 1959, can anyone tell me what these ladies are working on. I found this in one of my old folders. I cannot make out what the are working on? Just to give my mentors at Curtis Mathes a break. The stereo consoles and televisions from the early 1960’s were quite beautiful. This stereo console above and below had a FM and AM radio, with a turntable and a reel to reel, with lots of storage space. I will have to say she looks very nice with all her doors closed as well. Sometimes they would advertise their consoles on the back of the CM LP record albums the dealers would give away to customers. I will start with number 10 and slowly work down. Notice they said serving American Homes for 62 years. They are counting from the days they only manufactured window fans and in home fans. Please note that they had three plants back in the early 1960's one in Houston, one in Dallas, and then the Athens plant. This model is on the back of album number 10 and called the Upton a modern line design from 1960. Below is CM Album number two. And on the back we have "The Viking" a very retro and cool Danish modern console design with a turntable, stereo FM and AM radio and plenty of room for records or to add a reel to reel. This television console by Curtis Mathes from the same era is very much like the Viking in design. This was the Curtis Mathes, Athens Plant from the air back in the early 1960's. Back in the good old days working at Harvey Industries and Curtis Mathes, founded in 1919, was a tradition . For many employees, it was a family affair. Linda Eldridge, materials handler, worked there six years. She has six sisters and a brother. They all work at the plant. Husband Lonnie was the local union president, had more than a decade with Harvey before the union job employed him full time. Tragically when the plant shut down in Athens Texas whole families were effected greatly. It is very sad that the only thing going on in the back lot of the Curtis Mathes Plant these days is ducks mating! The CM Plant is not looking to good either! And the parking lot is very sad. Below is another beauty; this is a Curtis Mathes Radio from the very late 1950's about 1959 one of the first big production runs, same style was popular up to around 1963. I have been noticing that these sets are selling for more money this days! Below a lot of tubes and three very nice speakers for your money! Below you can see the very nice back board still in great shape. I know a lot of folks do not like Curtis Mathes products but there are a lot of these radios still going strong in 2010. Back in 1961 the world of Curtis Mathes was the world of Elegance and beauty. Photo above is a view of the Assembly Line for Television Chassis – Fine Quality is not an accident. One out of every four persons in the Assembly Department at Curtis Mathes is engaged in testing or inspecting. The photo above is Model number # CM217305. The two photos below show the inside of of John Phillips awesome 1967 - 1968 Curtis Mathes Color Console she is a wonderful early Hybrid of vacuum tubes and circuit boards made 1967 or 1968. The last hope for Texas television manufacturing was the Harvey Industries, Inc. (a.k.a. Harvey Joint Venture) and this slowed down last days of Curtis Mathes in Athens Texas. It was September 1982 and in Athens Texas things looked bleak for 850 workers when this East Texas town’s major employer, Curtis Mathes Corporation announced it was shutting down its television manufacturing plant. Officers of the Dallas based company said they were getting out of the TV making business. That’s when plant employees took matters into their own hands. Ray Harvey resigned as president of Curtis Mathes sales company’s, formed his own corporation, bought the plant, retained most of the employees, and was now making TV sets. His major customer was Curtis Mathes! Curtis Mathes officials had said their domestically made sets were too expensive. The company decided to buy its television sets elsewhere while maintaining its own distribution and retail outlets. To keep the Athens plant in business union members by an overwhelming majority approved a new contract at salaries as much as 27 percent below the old wages. Mr. Harvey said in August 1982, he now employs about 600 workers, while Curtis Mathes maintains about 200 persons at the plant to handle shipping, accounting, computer operations, and warranty repairs. Back in August 1982 Athens business man C.F. Hawn paraphrasing Mark Twain, said the reports of the Town’s economic demise are premature. “Everybody I run into said “I see Athens is closing up” They’re making a graveyard out of it and the truth is we never missed a beat. "farbaby" from the Antique Radio Forum, in my opinion c-m TV's were greats sets--my dad started a TV repair shop in 1960--I was 8 years old--he would take me with him on service calls---as i grew older I got totally engulfed in TV's--then I got away from it when I went to school mostly to play baseball on a scholarship---after about 2 years in school it just got to much for dad ---I went to work for him in 1972 and have not looked back---still in business today and enjoy my work--have had to learn a lot about these newer lcd, led and plasma sets to stay alive---anyway what i want to say is dad started selling c-m TV's around 1980 I guess--we sold a ton of those things for several years before "Lowes and wall mart" got into it with cheaper prices----we also sold zenith and Sylvania---but had to drop them when we got the c-m line---people would pay more for one of them---they were great TV's made in Athens Texas--or assembled there---the parts were of the highest quality--5 to 10% tolerance---I serviced one of those sets about a year ago---monster of a beast i remember delivering when we sold it--that thing was a home center--must have weighed a ton--it still has a very good picture--i still have a few c-m modules that I have never used somewhere boxed up in my shop---I cannot comment on the ones made earlier than that--but these I am talking about were very good quality sets---when Curtis died from smoke inhalation on that plane that caught on fire---things started going south very quick for the company---just a memory now---dad and I still talk about them good old days from time to time. The song in the video below “Anything You Can do I can do Better”, was one of the first songs used in a Curtis Mathes Commercial about the quality of the Curtis Mathes products. The Cabinet Assembly of the Curtis Mathes Plants in Texas requires careful quality control in the manufacture of wood parts, this work pay dividends in the assembly of cabinets in the cabinet room. Shown here are workers assembling, fitting and inspecting high fidelity cabinets. Dallas, Athens, and Houston, three made in the U.S.A. Curtis Mathes Electronic Manufacturing plants now gone forever. Here in this photo above is a model of the Williamsburg from 1961 that still works, I found Her at a Goodwill in West Indianapolis. In the photo below you can see her great control knobs and the FM/AM radios section as well, she is very well made. This vintage 3 in1 Curtis Mathes, model W2923 with serial number 41086 that includes the television, stereo and AM/FM radio with a beautiful light cherry finish. This measures 18x20x64" and is in good physical condition. As you can see from the back of her, she was very well made here in the good old USA. Here is Jimmy Steward’s CM story. At the age of 15 1962 I went to work for a TV shop in Springhill, LA that sold Curtis Mathes TV’s. All of the first chassis were build by Curtis Mathes both Color and B&W where licensed copies of RCA’s the main change was that a Standard brand turner was used. About 1969 B&W chassis were from Japan. I worked my first year out of college at Curtis Mathis factory in Athens, Texas as Engineering Technician. This was from May 1970 to June 1971. At that time, the CMC 16 (RCA) chassis was being build and a little junked Westinghouse Chassis we called the Rocket because the HV cage looked like a Rocket, were being built in Puerto Rico. This was the big time, employed total of 3,500 people, building 500 plus color TV’s a day in Athens. All the other factories were feeding Athens. Cabinets from Benton, Arkansas, color chassis from Puerto Rico, Picture Tubes from RCA and B&W’s from Japan. A 19” B&W from Japan complete in the box cost Curtis Mathes $12.00 at Athens. At the end of the line in Athens the CMC16 color chassis from Puerto Rico with tubes cost Curtis Mathes $8.00. Here is a wonderful photo of a restored Danish Modern Curits Mathes from1961 . Curtis Mathes Manufacturing Company was one of the first companies in American to have equal pay for women employees. All CM units undergo an extensive series of test. A selected percentage of these chassis are checked by quality control engineers to see that the proper inspection standards are being maintained. Here is Oscar Winslow working on a new model in 1961 at the Athens Plant. Curtis Mathes generated nearly $400 million dollars in 1985. The company began selling franchises in 1980; and boasted 650 stores in the USA in 1985. The Franchise owners dealt solely in Curtis Mathes products and Accessories, which were for the most part custom made in the plant in Athens Texas. The Curtis Mathes Finishing Department in 1961 – This picture above shows the giant convey-organized finishing room in the Athens plant. Shown here is the rubbing section where the cabinets are carefully rubbed to bring out all the beauty of genuine precious woods. In 1986 the trade magazine Consumer Electronics estimated that Curtis Mathes rang up $424 Million Dollars worth of Business in 1986. Mr. Bill Ward the franchise director said back in 1986 that the company’s success had been based on made in America high quality products backed up by extensive post sale customer service, most importantly a four year warranty on all products. Below is a photo from an airplane made in 1961 of the huge Curtis Mathes Plant in Houston Texas. All the components used in the final assembly of the Curtis Mathes High Fidelity united are carefully inspected before they go into the product. with its replacement 1967 Curtis Mathes turntable. Ninety-Nine Ways, Tab Hunter, Orchestra Conducted by Billy Vaughn. Little Miss Blue, Dion, Written by R. Isle. Below is a photo of the Curtis Mathes Factory in Dallas Texas in 1961. Below are two photos of Richard Emery’s beautiful Mathes Cooler Fan. One of the first to be made by the company right after World War Two. She was manufactured around 1947 to 1949. The NEC were more noticeable in the 1970’s due to contract problems with RCA. Some models in the 1980’s were NEC chassis’s in a heavy wood veneer Curtis Mathes built well laminated particleboard cabinet. Nippon Electric Company also did a lot of our remotes and some of our control knobs and panels. We had a re-badged program with RCA well in place when I was working with them. Sometimes even a Magnavox CTR would be worked into an order. Not like the good old days in the 1960’s when a Curtis Mathes was all CM. By the late 1980’s it was a major problem just to keep the company in competition with the flood of cheap televisions coming in from Asia. By the time Communist China got on line we simply could not compete with the slave labor. She was all wood with made in Texas trim, the speakers and components were custom made in Texas. Yes some folks say that once CM started letting NEC Corporation manufacture all their VCRs, turntables, eight tracks, and portable color TVs it was just a big old relabeling center in Athens Texas for the non-console division. But we still had a large number of made in Texas consoles and components being made in Texas. Many if not all of the Curtis Mathes top of the line products were much better built then the Sony and Zenith products of the same time period. It was good and also sad to work in the last days of the industry just to see what could have been. We did try our best with what we had to work with, laminated wood, and particleboard and wood grain plastic was a sad downward move from the quality workmanship of the 1960’s. Luckily most top of the line Curtis Mathes products still had real wood and veneers. Sometimes the televisions I work on look like Spanish Galleons with wood grain plastic moldings. But at least they were still coming down the assembly line in Texas and not China. For a time I would not talk about those days, the end of the American television manufacturing era, but I am afraid young folks will never know what a wonderful period it was and how awesome it was to see something you helped design and create come down a assembly line in the USA. I will have to say I was only expressing a short history of an American television manufacture based on my fond memories of working for the company. No political agenda was expressed. The Curtis Mathes Company did try its best to produce products to the best of their ability in Athens Texas, it was a Texas phenomena and back in the 1980’s you would be the envy of your neighborhood be it even a trailer park if you had a huge Curtis Mathes in your house. After all they were owned by Doctors, Lawyers and Indian Chiefs’ back in the early days. It was a branding that only Texas could really understand completely. My Curtis Mathes VCR’s and even my portable color CM television from the early 1980’s are still going strong see photos below. Both of these sets were very nice portables from my days at CM. Vintage Curtis Mathes 19 inch television set model J1940MW. Was sold in the year 1983. The styling of this set looks very 1970s. During this era was when the digital age started, and manufacturers were still putting out older styles. I have that VCR he is selling in this 1984 AD, and yes it still works. I did get a employee discount on it but she still was over four hundred dollars back then. We had show-rooms all over the country back then. And check out this television Ad. I must not forget Mrs. Mabel and her Curtis Mathes she will get up-set. She watches it everyday. The console was made in the 1960's and it is still going strong as well. It is even going digital with a new converter box. Few people knew that Honnor Blackman visited the plant back when she was filming Gold Finger. The company wanted her for a commercial but could not work out a financial agreement in time. She had just left "The Avengers" in 1963! I present number 9 in the 1960 production line from Curtis Mathes. This is the 9th album with the Hartford production model on the back of the album. The Hartford was a Early American model of a television console with a stereo radio and a turntable in a all wood cabinet. Each of the ten models came with their own album of music. Ten completely different albums of music. Each one unique with some of the best music from the era. Here below is the back of album eight, but she is just a stereo console, but there are many more to come. Below is the Westmoreland a very nice all wood French provincial model with a turntable and FM and AM radio and very nice large stereo speakers. This is the number 8 album of smooth music in which the Westmorland AD is on the back of this CM album. Sometimes we let things go and then realize later that they do not make that stuff anymore. It is getting to the point now that a console you find might be the last one of a entire era left on the planet. So many are going into landfills and crematoriums these days. Children today do not even know how to use encyclopedias’ people do not even keep books anymore, that is such a tragedy. I remember the American Society of Interior Designers and Curtis Mathes national design competition in 1983 when Ralph Campbell, vice president of communications for Curtis Mathes had a wonderful contest design competition. He said consumers are baffled by the number of different entertainment and electronic products on the market. More than 50 actual designs were received from professional and student members of ASID. I even submitted one<LOL> . I did receive a 14kt gold CM awards tie pin in 1986 for one of my television console designs. The competition called for designers to solve the problem of the morass of home-entertainment and educational products and accompanying wires and accessories by integrating various shapes and sizes of products in a aesthetic manner. There were nine judges four were professional designers and the other five were leading design publication editors. First place winner was George Wachob. Pamela Gragg was the winner of the student design category. Raymond Boorstein took second place and the third place winner was Loretta Prokop. Here is a awesome photo of the Curtis Mathes Plant in Fort Worth Texas around the year 1959. Back in the golden age when Curtis Mathes was all made in the USA by proud Americans. Burke here. Really enjoyed your Curtis Mathes history--brought back many memories--especially meetigs with Mr. Mathes Sr at 2220 Young St. with his yellow pad and #2 pencil sketching out new designs. I shared it with some colleagues whom you may remember: Bill Park and by way of Bill to R.C. Spitzer and Ray Harvey. I also shared it with Curtis Mathes Jr's oldest daughter and son. As I stated earlier in this post in the late 1950s, George Curtis Mathes, Jr.’s corporation entered the television manufacturing market with only the knowledge of producing box fans for business and residential customers. With-in a few years Curtis Mathes soon began producing a line of color televisions. Over the next twenty-odd years color televisions began popping up in households across America, but it wasn’t until the early 1970s that the color television started to overtake the longstanding black and whites in living rooms. Just like today’s flat screen televisions, the new technology was expensive, so it took a while for retail prices to drop low enough that an average American family could afford to have a color television in their home. The two photos below were taken by an airplane in 1961 of the Curtis Mathes Plant in Athens Texas. However, Curtis Mathes wasn’t looking to compromise the quality of his product to meet ideal selling prices. When Curtis Mathes began manufacturing televisions he had one major goal in mind; to have the most well-built, reliable and expensive television on the market. In his Texan mind, He did. And, he was convinced in a Texas view they were. The televisions were so well built that each set had a four year warranty, which was unheard of at the time – and today for that matter. But, if consumers wanted the best they were going to have to pay for it. The sticker shock was so great for the average consumer that CM Showroom at first were only popular among Lawyers, Doctors, and Indian Chiefs. Some folks thought that people who had more money than sense would buy a CM television or stereo. So, by the end of the 1970s the folks at Curtis Mathes believed they had perhaps the finest color television set in the world, but because of its price tag most Americans couldn’t afford to purchase it. That’s when Willie Talley stepped in and partnered with Curtis Mathes. Willie had an ingenious concept, “ColorTyme.” Willie believed at the time that it was “tyme” for all households to have “color” television…hence ColorTyme. While he didn’t expect the name to become so quickly dated, it has stuck over the years. Willie’s idea materialized in Athens, Texas in 1979, where the first ColorTyme rent-to-own store opened. With the store’s opening came the opportunity for every average American family to purchase the finest color television available. Curtis Mathes didn’t have to sacrifice quality, and any American household could now afford to move from the era of black and white into the time of color. Needless to say this business ventured tripled the output of color televisions Curtis Mathes was manufacturing in the early 1980’s; so it was good for the economic survival of the company at the time it was implemented. Below is Maria's wonderful Curits Mathes portable. A year later, Willie and his partner purchased ColorTyme from Curtis Mathes. In 1982, the concept was transformed into a franchise. And, even though Curtis Mathes no longer owned any portion of the ColorTyme concept, the company opted to implement the successful rent-to-own strategy in Curtis Mathes retail stores, which can be seen advertised in this 1984 commercial. Today, ColorTyme is the nation’s oldest franchisor of independently owned and operated rent-to-own stores. Thanks to the most expensive television set in America. Many people think the rent to own concept hurt the Curtis Mathes brand because it made the company niche in the market change from only the wealthy to blue collar buyers. But in a industry that was fighting to stay afloat it seemed like a smart move in the turbulent early 1980’s with a huge recession and overwhelming overseas completion. It would have be interesting to see if the outcome would have been different had they stayed with only the very wealthy. But based on what I have seen they were only trying their best to stay afloat in a industry that was already badly torpedoed, and taking on water faster than the pumps could pump out. This Curtis Mathes 23" B&W combo unit is a very nice vintage set. This beautiful back and white Curtis Mathes console is from Charlie Trahan! Thank you for sharing Charlie. Here is a picture I found of the Curtis Mathes radio with legs attached. I am not sure if the legs are the original ones from the factory or as in your case replacements. If only the massive records department of all the old Curtis Mathes plants had not dumped everything into the dumpsters during the bankruptcy we would have a more complete picture of manufactures and suppliers of the early days of television production era in the USA. I do remember Magnavox and Sylvania were supplying some CRTs from their huge Greeneville plant in Tennessee in the end before CM succumbed to the overseas landslide. Westinghouse and Magnavox in the early days were linked with Curtis Mathes in some television production ventures in the very early 1960’s. Below is a photo of the Magnavox Company of Tennessee in 1966 before they substantially enlarged the Greeneville, Tennessee plant. This plant was one of the company's principal facility for manufacturing black and white and color television sets as well as stereo combinations. (This photograph shows the plant as it looked before the new addition was started.) This was just one of the plants Magnavox once owned in the USA. Here is Album Seven; with the beautiful Williamsburg on the back of the Album. She had a TV, stereo FM and AM radio and a turntable. The photo below is of the Conveyor Line for Sides and Topes at the Curtis Mathes Plant in Athens Texas in 1961 – The sides and tops for the CM Hi-Fi are trimmed to size, banded, sanded and inspected on this line. Highly mechanized line such as this makes it possible for Curtis Mathes to produce the very finest cabinets at cost only slightly above inexpensive furniture. Mike B a member of the Antique Radio Forum worked at Curtis Mathes (Harvey Industries) in Athens from 1978 until the plant shutdown. In 1988 and 1989 Mike remembers we were really cranking out the sets. We were building OEM product for Pioneer, Funai, Radio Shack Samsung, and NEC, as well as still building for Curtis Mathes and Colortyme. Oh yes, remember the Dumont? We were building a line by that name as another rental line. Of course the chassis were coming in from the manufacturers but we would build the cabinets and perform final assembly and alignment. We had 9 final assembly lines running at one time and producing 1500 per day all brands combined. Mike was over Quality Control and did an awesome job. And on the back of this selection of smooth music is "The Royal Dane" a all wood console stereo in the Modern Danish design with hand polished wood finish. She comes with a turntable, full stereo FM & AM radio and a choice of reel to reel or later imputes such as a 8 track player. Lots of storage space for records in this model. This Royal Dane is a beautiful old girl check out the three photos below. Here is another beautiful Royal Dane! She is a very cool mid century modern Curtis Mathes High Fidelity Music Center Measures about 74"L x 31"H x 18"W.
Includes a record player that plays 78, 45, 33, and 16 RPM, an AM/FM Radio, and a reel-to-reel tape recorder player with mic Sleek cabinet with rolling tambour doors. Then there is my favorite Royal Dane from 1961. This beauty does not have the reel to reel but has loads of storage space for your record collection. Here is a great photo with her back off, showing her great speakers and all the space in the bottom for records. Needless to say this was a very nice model in her day, and she still is very cool today. Many folks have ask me in the past how the Curtis Mathes company could claim to be 62 years old in 1960. Well the answer is that before the company got into the official furniture and electronics field they produced fans for homes and offices. This of course was before air-conditioning and they did a booming business in the south west. Once air-conditioning became big in the late 1950’s the company had to make a move and make it fast so they did so by moving into the television era. Below is a example of the fans that the company made in the early days called a Mathes cooler. Description Console Model no. M2664RW Run 01 Curtis Mathes Corp.
One of the the last fighting attempt at producing a fine piece of American workmanship. Here is Album number 4 for viewing. And on the back of Album number 4 we have "The Burgundy" a very beautiful Stereo Console in the French design, with a hand rubbed all wood finish and nice details. She comes with a turntable and stereo FM and AM radio and nice big speakers. Below for your amusement is one of my many console designs in 1986 that just did not make it; I was just over the budget. I guess I was just still thinking we could go back in time and be in the 1960’s and I could not see the sign of the times. If only it had been built. It is truly tragic how many wonderful concepts, designs and ideas end up in dumpsters because of lack of funds. The CM stereo console below and above is a larger scale model in the French design. I am not sure of her name however. Here I have Album number 3 of the Curtis Mathes record collection with “The Provincial” on the back of the cover. This is a very elegant console in the French Provincial design. She has a much more spacious cabinet than her smaller sister, "The Burgundy" in the earlier post above. She comes with a turntable and a stereo FM and AM radio, and she has huge speakers and plenty of storage room. And finally for your amusement is another of my rejected designs. This one is from 1987 and her name is “The Constellation” once again I got to creative with the woodwork and the molding. Towards the end days it was best to stick to the plywood and particle board and not try to be to creative in the trim. That was a sign of the end of the game for the US team. I do hope to one day find this model with her television still intact, there must have be a problem with that run. Here is a cool brochure from the early 1960’s; it has some very sweet Curtis Mathes Color Console. It is amazing that the company would flip from being the most expensive to being not expensive. The two Photo below is a Super Clean Fantastic working Curtis Mathes A.M. F.M. tube radio from 1961 Radio is in excelent condition inside & out. Works Great Picks up stations both bands with super selectivity. Radio pulls in stations from all over. Sound is Awesome from the 6EU7 6BQ5 output amplifier. This radio has three speakers 8'' Bass 6'' Mid 4'' Tweeter. They produce pin drop hi notes plus deep bass. Controlls include Treble, Bass, Volume On Off Band select Am, F.m. F.m. A.F.C. plus Phono in If you want another input suorce. Walnut case is in great shape No Issues!! No chips This Curtis Mathes also has a lighted dial. This is a heavy well built Hi End radio. Measures 12'' tall 22'' wide & 8'' deep I removed the back for photos also has built in antenns. All in all a very hard to find radio as close to mint as your will ever find. The two photos below are of a wonderful Texas made radio by Watterson Radio Company of Dallas Texas. She was made in the early 1950's. Below are two photos of a very nice Curtis Mathes VHS Camcorder. These are four photos of two 1985 Curtis Mathes Console in wonderful working condition. I remember working on the cabinet design of this model. It also contains a Record player, Tape deck, and 8 track player. Model number K2675RK. Another beauty that was custom built. And yes she is still working. Below is anther Curtis Mathes Stereo that works with wonderful sounding speaker. Check out this Fantastic, 1970's Model Curtis Mathes Console Stereo. This model has an AM/FM Stereo Receiver and a Turntable that plays 16, 33 1/3, 45 & 78 RPM Records. Great Condition with a few minor nicks and bumps mostly on corners. The Tube Type Stereo Amplifier works great, with occasional static while turning the volume control, always levels out though. Take a look at those speakers! A 12" woofer, 8" mid range and two 5" tweeters per channel, all in great shape! Measures 86" long (7' 2") 18" deep and 28" tall. You'll look long and hard before you find one this nice anywhere! On June 2, 1983, the chairman, George Curtis Mathes Jr, 54, died along with twenty-two other passengers in the Air Canada Fli797 fire, which started in a rear lavatory. After the death of its founder, the Curtis Mathes brand began to die a slow death. It went from a peak of 5000 employees and seven manufacturing facilities to about 50 employees when it was sold. Curtis Mathes filed Chapter 11 in U.S. Bankruptcy Court on January 27, 1992, and was granted reorganization on September 1, 1992. The brand also appeared briefly in the late 1990s to early 2000s as an in-house brand for Kmart. I do not think any of the products from that time period were made in the USA. As of late 2007, Curtis Mathes has re-emerged with products at several retailers such as Wal-Mart, Sam's Club, Meijer and Target. The company has a new Head-office in Frisco, Texas. I am not sure if Enhanced Electronics is still the new owner however. Curtis Mathes always had wonderful design in three in one consoles back in the golden age of the early 1960's; as is seen in the Beauty of this wonderful 1961 Curtis Mathes Danish Modern. Open her up and see the beauty on the inside. When it comes to a classic the name plate said it all in big bold letters. "Being about 30 miles from Athens, I know about that plant. In fact, I sold tons of screws for assembly. I think I still have my old RoloDex from those days at Screw Products, Inc. (no jokes now!) Quite a facility. I'll look and see who the buyers were back in 79-81 or so. I did visit once, but I don't recall much besides the fact that it was rather large and spread out. It was something to be proud of in that we were still able to successfully compete against imports at the time. Good old days." Mr. Bob Taylor making sure everything works perfectly on the new model for 1961. Quality checks were carried out at every stage of production. Below is Karah with the Curtis Mathes Console television, Made October 1981 the Curtis Mathes Model G552R Color ConsoleTelevision. In 1979 I won a student contest in industrial design presented by Curtis Mathes in which the contestants had to devise a way to reduce the weight of a full color console by 20 pounds and increase the strength and durability of the same console at the same time. I came up with a design for a full bumper guard around the base of the console that would replace the bulky and brittle wooden base with a light weight durable fiberglass and bonded plastic with an exterior wood grain veneer. The base would be anchored to the console and have coasters and a honeycomb strengthened design which would protect the console and made it lighter and easier move. The four wheels in which would help make the console more easer to move would be anchored directly into the molding of the full bumper in a web design for strength and support. This one piece base would be durable and very impact resented and I won the student contest in this division in 1979. It to this day is a great honor to see my design worked of 29 years and still counting, to protect the consoles that had this design concept applied to them; such as the 1981 Curtis Mathes model G552R made in 1981. 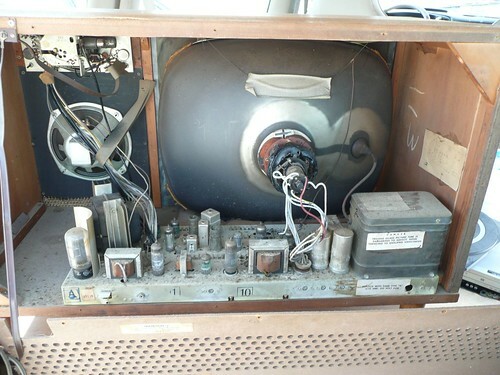 The two photos below are of the inside the Curtis Mathes console television, Made October 1981, Model Number G552R. The awesome control panel of the Curtis Mathes console television, Made October 1981, Model Number G552R. You will not find any televisions made in Texas these day in America. Photos below are of a Color Console Television made August 1988, at Curtis Mathes Corporation, One Curtis Mathes Parkway, Athens, Texas 75751. The Model Style Colonial Jacksonian. U/L Listed 72H7 video product. They just do not make them like this anymore. Photo above is the very nice remote control that came with the 1981 Curtis Mathes model number G552R. Gene from the Antique Radio Forum remembering Curtis Mathes:"I worked for a TV repair/sales and rental in the mid-seventies that sold CM products. They sold the TV's on a rent to own deal to people with no credit. The entire time people were paying on the sets, they were guaranteed 100%. I don't remember many repairs having to be made on them. A quality TV for a reasonable price." " I worked in Seattle selling Muntz tv's in the early 1960s. Our store changed from Muntz to CM in about 1963. I remember a big CM semi pulling up and unloading about 50 sets to get us started. The factory salesman who showed up at the same time was smooth as silk, and I remember we were all impressed by his sales ability. One set, the top of the line model, sold for about $1000 and came in a rubbed walnut cabinet about 8 feet long. At that time Motorola had some cabinets made by Drexel, but few other manufacturers had the furniture that CM had. I agree with those who lament the loss of manufacturing in the U.S. Just look at Detroit were I lived in the late 1960s. Maybe if you are under 60, you wouldn't know how much has been lost." "In 1982 I purchased a Curtis Mathis Floor Model Television set from a Curtis Mathis Dealer who sold exclusively their television's , they were displayed with no prices they were the elite Brand at which I paid $1500.00 for I was told that I would get sick of the Set before it quit running and it also came with a 4 year Guarantee and Lifetime for the Remote. About 4 years later(1987) I purchased a VCR From Curtis Mathis for $375.00 it also had a 4 year Guarantee.----My Television set Which was Purchased in Michigan did have a picture problem one time 8 years later when I moved to Virginia , I called Curtis Mathis Customer Service Line they came out picked up my Television gave me a loner and kept the set for 10 days and charged me nothing , to this day my VCR has never broke down and the Television Set is still going it won't quit.--Now That is Quality and it was then American Made.The best Curtis Mathes is an old Curtis Mathes! The two photos below are of a beauty from the 1980's. I remember working on the design team of this model, she was a wonderful console with great workmanship. The two Photos Below are of a very rare Curtis Mathes branded computer. It was manufactured by Arima back in a day and was sold at American Microtech in Dallas under the licensed branding of Curtis Mathes. It is a 386SX/20 with 2M ram. It works fully. I'd have to say that very few of these still exist. "A bit of trivia...I lived on the island of Nevis (part of the Federation of St. Kitts-Nevis) in the Caribbean during 1987-88. Nevis was quite primitive back in those days and only had a population of about 11,000.Basically un-skilled folks. There was a factory still in operation that 'made coils'. A local fellow told me, with a certain amount of pride, that they used to make coils for Curtis-Mathes televisions. I don't know if there's any truth to that but the rumour must have started somewhere! How would he have even known the name of C-M? The company was Coil Craft and I once met the manager of the then current factory but he was a young local guy that did not know anything of its past. I have seen the factory and even back then it was an old relic. I doubt they still exist. I think they also had a factory on the island of St. Kitts in the same timeframe. Anyway, given your interest in C-M I thought you might find this interesting. I grew up in a small town in Eastern NC and we had a local C-M dealer. He was also the local guy for Philco/Ford TVs in those days (70s). He was, how shall we say, not the most reliable dealer to work with :) I started working for the cable tv in town in 1973 and encountered many older C-M tv sets, particularly in upper class homes. They were really quite the scourge for us cable guys - mostly because these older/upper people had bought them 10-15 years earlier and expected them to live forever! Thanks for your saving and compiling the memories of C-M."
This is a wonderful photo from Bill of how things once looked in the Caribbean. Thank you Bill this was very fascinating information. Yes I do believe the man was telling the truth. The Mathes family loved to invest in the Caribbean area! Thank you for the awesome information! Curtis Mathes Corporation, was the only family-owned company of its kind, manufacturing high fidelity entertainment systems and black-and-white and color television distributed throughout the United States. The firm had factories in Athens, Dallas, Houston, and in Benton, Arkansas, Nuevo Laredo, Tamaulipas, Toa Alta, Puerto Rico, and St. Kitts, BWI. His name became well-known in home entertainment systems throughout the western U.S. Curtis Mathes Sr. was s resident of Arlington for almost thirty years, he was active in charitable projects in the Metroplex area. He was a member of the Methodist Church and on May 1918 married Gladys Speer. They had two sons and a daughter, who became executives of the Curtis Mathes Corporation. Mathes retired to Escazú, Costa Rica, in 1975 and died there on February 22, 1977. He and his wife are buried in the Cementerio de Escazú. No Sangamo Little Chiefs in this Curtis Mathes beauty! The Curtis Mathes Company loved to use Sprague and Cornell Dubilier. Curtis Mathes Color Console Television. Made May 1987, Curtis Mathes Television model B2610RC. It has a very nice CRT, and has been a daily player for almost 26 years. I know that RCA and JVC sometimes made Curtis Mathes CRT’s for the company after 1980. But this amazing console has ... WOW a Hitachi A66ABU30X Picture Tube, no longer in stock and they sold for $506.07 back when they did have them..
That is simply amazing this is first I knew of this, and I worked in the cabinet design department for Curtis Mathes back in the stone age. I knew they were always having to scramble to get CRT’s. I will have to add Hitachi to the list of known suppliers back in the 1980’s of Curtis Mathes Picture Tubes. Photo below is Tom Thornton working hard at the Curtis Mathes Plant in Athens Texas back in 1961. The history of a CM High Fidelity Unit is a story of quality control. This story of quality control begains with the punching of the chassis in the metal fabricating shops. By fabricating and plating its own chassis Curtis Mathes not only controls quality but also cost. . In the photo below American finest hard wood being hand milled at the Curtis Mathes plant in Athens Texas. This view of the Plywood Department show's that in 1961 the most modern of wood working techniques and the latest material are used in the construction of the CM High Fidelity cabinets. The CM plywood department is a good example of the application of those new techniques. In the photo below skilled workers are making the speakers for a Curtis Mathes console at the plant in Texas. All the components used in the manufacture of Curtis Mathes Speakers are rigidly inspected before assembly to insure the very best performance. All CM speakers are hand crafted in Texas. We wish to thank Carter Cook of the ‘’Texas Antique Radio Club” for all the wonderful information below that has been used in the awesome facts and details below. Carter Cook’s article “Texas Radios” was extensively used for most of the facts and writings below. Thank you so much Carter for contributing to this site. Below is a beautiful Curtis Mathes Radio from 1959. Model number 2918A "The Victoria" she comes with the optional legs. A very nice retro Eames Era design. For more than a quarter of a century that extended from the 1930s until the close of the tube era and beyond, Texas entrepreneurs manufactured or assembled a string of radio brands in cities and towns all around the state. Most were made in relatively small quantities and only for a short time. All but a few are little remembered. The two photos above are of a very nice Watterson Radio from the 1930's made in Texas. The city of San Antonio was home to Radioette, Sferics and (naturally) Alamo brand radios. Dallas had the most manufacturers, including Dalbar, Aldingson, Talk-a-Radio, Davis, Curtis Mathes and the probable best known of the early brands, the Watterson. Although production consisted of only two engineering prototypes by Texas Instruments in Dallas, the worlds first all-transistor production radio, the Regency, had its beginning in Texas. Houston produced Curtis Mathes as well as the Texan, about which little other than the name is known. Only an advertisement in an early Houston telephone directory attests to the existence of the Texan. There are no surviving examples of the radio itself. Here is my awesome Watterson Radio model 530, a real Texas Beauty. Smaller cities added to the total. Athens was home to a large Curtis Mathes plant that made radio, radio phonograph, and television receivers. Rangeaire radios, which were integrated into home intercom systems, were made in Cleburne. The Texas manufacturers generally produced their radios to fill niche markets: the Rangeaire and Talk-a-Radio were built as receivers in conjunction with kitchen/home intercom systems; Aldingson made coin operated radios for hotels; Curtis Mathes aimed for the upper end of the market, emphasizing fine cabinetry. Here is a very retro Curtis Mathes Radio from 1961. Wattersons single most collectible model is the Texas Centennial receiver, created as a tie in to the states 100th birthday bash in 1936. Davis was a high fidelity brand for the audiophile. And then there was the Sferics radio from San Antonio. Photo above the Watterson Texas Centennial receiver was a Beauty. The O'Connors were a ranching family with extensive holdings in land and cattle in Victoria and Refugio counties of south Texas as well as part or sole interest in several banks. One of the third generation, Dan Brahman, decided that the part of the world he was concerned with, south Texas, needed an inexpensive storm warning radio. So in the 1960s he set up a radio manufacturing company in a San Antonio storefront which lasted only about six months.The company produced a tube-type Bakelite radio, model SF-1-1, with a normal enough looking AM radio dial on the left side of the cabinet. On the right side was a large square meter with an area labeled A Severe and marked in red at the extreme right of the meter pointers travel. Photo above was one of Wattersons best seller in the 1930's. To operate as a storm alert, one would tune above the broadcast band and switch to Alert mode, at which time the radio would mute. The right side meter provided a relative indication of the severity of static from lightning. The radio emitted a warning tone when the meter indicated static in the severe range. A current owner of a Sferics receiver completes the description of the radios operation: You then switched the radio mode to listen. My observation has been that by the time it reaches Severe you are getting blasted enough with thunder and lightning that you probably don't need this to tell you! The unusual name a Sferics is a play on the word atmospherics. Really Cool Vintage Curtis Mathes Products. The three photos below are of a wonderful 1983 Curtis Mathes color console. She works as good as the day she left the show-room floor. A very well made all American Television. The two photos below are of Charles "Chuck" Pomy awesome Console from the 1980's she is very nice. Thank you Chuck for the great photos! The model number is # H2503ME. I remember working on the design team of this wonderful model. She was a very popular console on the Show-room floors. We had a good production run on this design. I have some of the paper-work on her somewhere in one of my storage areas. If only I could find the papers! This is the picture problem with Chuck's Beautiful Curtis Mathes. Hopefully he can get the correct Schematics so he can fix the problem as soon as possible! If only the company had not destroyed all their television records when they file bankruptcy in the early 1990's. 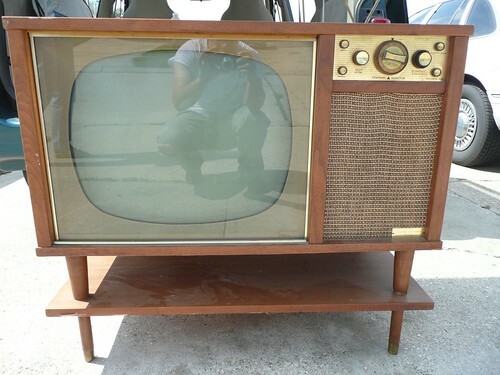 The photo below is of a nice Curtis Mathes black and white portable television. The two photos below are of a set of really nice Curtis Mathes AMP's. The first three photo below are of a custom built Curtis Mathes Stereo Console. The next one is of a very nice CM console with a Curtis Mathes tape deck. The photo below is a very nice dual cassette player made by Curtis Mathes. Two photos above are of one of the very last big televisions to come out of the Athens, Texas Plant in 1990. The video below is of an awesome Curtis Mathes Stereo. Those Wonderful Show-rooms and other cool stuff. Blac k and white movies always look good on a Curtis Mathes Console. This is beautiful Curtis Mathes from the early 1980's and she works as well as the day she was made. Curtis Mathes VCR's were built to last. If you got a CM VCR from a Showroom back in the 1980's chances are she is still going strong. The belts might need to be replace after she has been the family work horse for 30 years. The two photos below are Grantley working on his 1984 Curtis Mathes VCR. She was built to last. Not like the junk coming out of China these days. Those awesome Curtis Mathes VCR's Can stand the test of time. They just do not make them like they did back in the 1980's. You would get a free set of tumblers when you visited a Curtis Mathes Show room back in the early 1980's. A free remote came with every console television. Photo below is Charis with our 1961 CM Stereo. The wonderful world of Curtis Mathes. The Photo below is of awesome Curits Mathes Boom Box. Grantley and Charis love watching their "Lost in Space" on the Curtis Mathes before bed time. The two photos below are of a free book of matches form Preston TV in Detroit, Michigan. The photo below is of the inside of the Curtis Mathes show-room free book of matches. Check out the AD on the inside of the cover. Love to CM truck. I bet you cannot find a good photo of those anywhere these days. The two photos below are of one of first modern designs for Curits Mathes back in 1986. She came out in the Fall of 1986 her model number was # A2668RL and she was 180 Watts, 120 Volts, and 60 Hertz. The wonderful control panel on the 1986 Curtis Mathes console I helped design. Later Zenith came out with a clone of my console Design. The first stereo records ever made were cut in February 1958. Curtis Mathes, Jr. had been building and refining his own stereo unit. Within a month after the furniture show in July 1958, they were manufacturing beautiful solid cherry, walnut, mahogany, and maple stereo cabinets. Huge and Awesome and sweet retro Curtis Mathes Consoles. The two photos belwo are of a nice Early American 1963 Curtis Mathes Console. Two photos below are of a very nice 1961 console model from Curtis Mathes. Below is a very nice four in one television console with extra huge speakers made by Curtis Mathes in the late 1970's and early 1980's. Very nice and Retro Curtis Mathes Wall Console unit with 8 track player. Josh and Holly Compton's beautiful 1981 Color Console by Curtis Mathes. A real American Beauty. The photo below and above show the beauty, workmanship and design that went into Josh and Holly's beautiful 1981 Curtis Mathes Color console. From her hand rubbed finish to the wonderful wood work and trim she is a true American classic. She is Model number # G528R and is the very first to come down the assembly line in Texas, "Run-01", that is amazing to have the first television of an model run. Burke Mathes told me that this model has the webbed underpinning and console bumper guard that I won a design award for designing. Needless to say I was extremely proud to know that something I had designed went into this awesome console. Great job saving her Josh and Holly. In the photo below you can check out the wonderful color of Josh and Holly's 1981 Curtis Mathes compared to the 2010 made in Asia flat screen on top of her. The Curtis Mathes is real American made wood furniture, the China flat screen is just plastic. This Model of the Royal Dane belongs to Roy Ansell, what a beauty. A wonderful 1961 Scandinavian design. They really knew how to make fine stereos and furniture back in the good old days at the plants in Texas. What a wonderful stereo Roy! Thank you for sharing your photos with us! Plenty of storage space in the beauty from 1961. She is truly a classic. Well this is just a awesome example of the Royal Dane, with the total package, she even has her deluxe shelves and a glass top protector. Curtis Mathes Collection of Stereo Music and much more!! Curtis Mathes Collection of Stereo Music Album 2, Medley, Getting to Know You. Curtis Mathes Collection of Stereo Music Album 2, June Is Busting Out All Over. CM Collection of Stereo Music Album 2, Quiet Girl, Dave Brubeck Quartet. Curtis Mathes Vacuum Tubes, made in the USA, for the Best Sound. Curtis Mathes Collection of Music Album 2. Camelot plus much more! Grantley's Shocka, CM Stereo Collection of Music, Camelot, Percy Faith Orchestra. Martin Denny, Exotica Volume 2, played on a 1961 Curtis Mathes Stereo. This is a awesome 1961 Curtis Mathes Stereo Console with a turntable and a FM and AM radio all vacuum tube the way music should be played. WIth 100% Curtis Mathes vacuum tubes you are going to hear only the very best. That is why she has been going strong since 1961. The joy of 50 year old stereos working like they are new! CM Collection of Stereo Music Album 1, Baubles, Bangles and Beads and much more. A Summer Place by Billy Vaughn & Tammy played on a 1961 Curtis Mathes Stereo.